The Name of this Book is Secret - first book of a series by "Pseudonymous Bosch" - a humorous series for younger teenagers. A book about a 14 year old lawyer Theodore Boone from the Classic storyteller John Grisham. And a big favourite certainly with teenage boys is the Cherub series. What a hit this series has become and the author has an interesting story to tell. He decided to write a book for his nephew as there seemed to be no decent books around for boys to enjoy. Well he's certainly managed it with this series. Every teenage boy I know who has read this series has become addicted to it, although I must warn you that you might want to check the content of some of the later ones. So now you dont need to worry. Never again on a camping holiday will you hear the refrain : "I'm bored, there's nothing to do !" Puy du Fou voted Best Theme Park in the World ! Tbe French theme Park Puy du Fou has been voted "Best Theme Park in the World" at the Thea Award Ceremony of the "International Asssociation of Amusement Parks and Attractions" in Los Angeles. The Vendée park, between La-Roche-sur-Yon and Angers, was chosen ahead of 700 parks and shows in 40 countries to receive the Thea Award at a ceremony in Los Angeles. This fantastic historical theme park tells the history of the Vendeen region through a series of arena shows where visitors can watch performances starring Roman gladiators, swashbuckling musketeers, marauding Vikings and fantastic swooping birds. We all had a different favourite show but they are all fantastic and well rehearsed. There is a new show this year to celebrate the parc's 35th Anniversary and I believe this show will feature acrobatics on horseback ! There is also, of course, the famous night show at the park, which features numerous horses and a cast of hundreds. 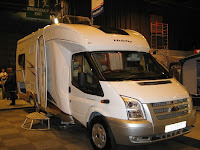 We have a family set of 6 tickets to give away to the Caravan & Motorhome Show at Broadlands, Romsey (near Southampton). The show runs from Saturday 7th April to Monday 9th March 2012 and is a great chance to have a look round the latest models of caravans and motorhomes. If you are thinking of buying a motorhome or caravan then nothing beats actually sitting in one to get an idea of the space and equipment they contain. Much more sensible than looking at a diagram ! If you would like to enter then please add a comment to this blogpost or find us on Facebook at Best French Campsites and enter the competition there. Closing Date is the 26th March. Good luck ! See Paris by Bike ! It tells you routes to use in and around Paris, a description of things you might see and it also has handy sections about the parts of a bike and also about the law with regards to cycling in France.